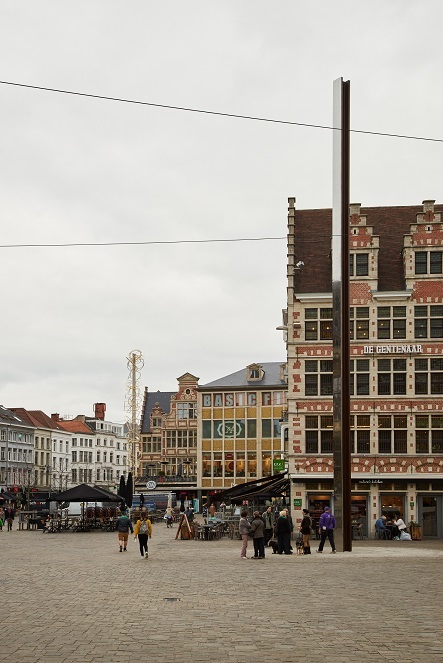 Since 28 September 2017, the Korenmarkt square in the city of Ghent (Belgium) has a new look: two slender artworks of 20 metres are now part of the landscape. One of them was realised in sponsorship with ArcelorMittal and consists of a HD 400 beam produced by ArcelorMittal Europe – Long Products. 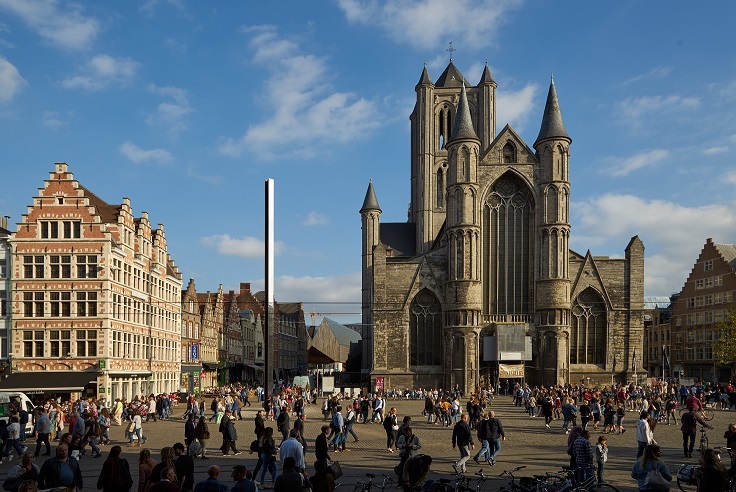 To bring the final touch to the renovation of the Korenmarkt square, the city of Ghent commissioned two permanent artworks from international renowned artists Ann Veronica Janssens and Ayşe Erkmen. Ann Veronica Janssens’ artwork, named HD 400, is one single HD 400 beam of 20 metres and 14.6 tonnes produced in ArcelorMittal Europe – Long Products’ mill in Differdange, Luxembourg. The HISTAR® S355 beam is similar to the ones used in the construction of high-rise buildings such as the One World Trade Center. HD 400 has one reflective side, a mirror effect obtained thanks to stainless steel plates welded on the beam. Thanks to the good relationship between ArcelorMittal and the city of Ghent, Ghent directly liaised with ArcelorMittal Gent to obtain the beam as part of a sponsorship. ArcelorMittal Gent being a Flat mill contacted ArcelorMittal Europe – Long Products who provided the beam. The mirrored side of the artwork brings a play of light; the shadow of the beam and the mirrored side reflection turn around the artwork. They never meet, but the chosen orientation of the mirrored side will allow the sun, the reflection, the HD 400 and the shadow to be aligned every first of May at 4PM. Ann Veronica Janssens is known for creating interaction between material and immaterial in her works. For HD 400, she wanted to create an ode to the art of building, architecture, engineering and human ingenuity, symbolised by the H-beam (or I-beam), omnipresent in contemporary construction. By orienting the mirrored side of the beam in such a way, she wanted to give the impression that through the reflection of the sky and clouds the city is almost split by the projection. This artistic initiative represents the strong commitment of the City of Ghent to use art in a public environment. The city aims to reuse art and culture in the public space to involve everyone. The two artworks are in line with other major art projects realised in the past few years, such as The Virgin and Passengers of Michaël Borremans, the light artwork The Blue Birds at the Predikherenlei, and Garutti's work on Sint-Veerleplein, where the street lights flash every time a child is born in a Ghent hospital.